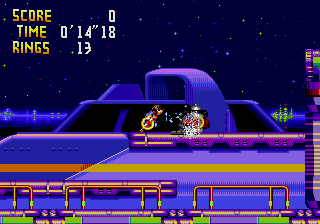 Marina Madness is one of the five main levels of Chaotix. As the name implies, it takes place by an ocean marina where platforms mostly consist of ocean docks and cruise ships. Strangely enough, this level doesn't have any water-based elements or hazards to deal with. The levels are pretty horizontal, as well, compared to the other Zones in the game. However, they require much moving left and right in a zigzag fashion. Switches on the cruise ships can be pressed to ferry the player and partner to other areas of the level. This page was last edited on 23 December 2018, at 17:51.